Designed with cabinetmaking in mind, these well-balanced Mortise Chisels are ground with parallel sides and are thicker than they are wide to help keep them straight in the cut. Made of A2 Tool Steel, hardened to Rockwell 60-62, cryogenically treated and double tempered. Maine-harvested Hornbeam handles. Overall length is approximately 10.5". The bevel is hand-lapped at 30º, but a higher secondary bevel of around 35º is advisable, depending on the wood and how the chisel is being used. 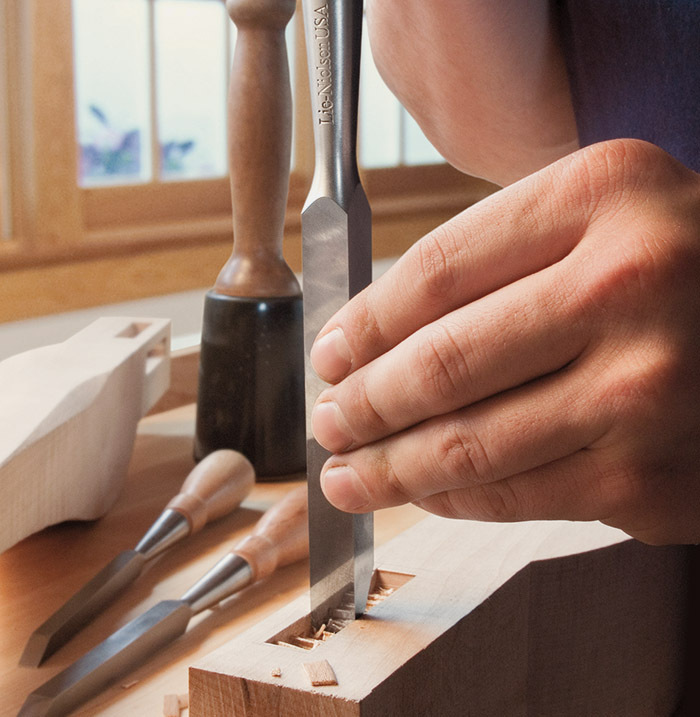 On very hard woods, like oak, hard maple or exotic species, take lighter cuts and use a higher secondary bevel. Backs are ground flat and finished by hand at 600 grit. Additional honing is recommended. You can find sharpening instructions in a printable PDF format here: Sharpening Instructions PDF. Available in the following sizes: 1/10", 3/16", 1/4", 5/16", 3/8", and 1/2".